Because for anyone who's followed them through years, Sandwich could be seen as modern day explorers looking for new soundscapes to conquer. Their 6th album though, Contra Tiempo, is more about polish, a quality which we definitely like in our music. Don't be surprised though if it doesn't feel as new anymore. The album opens with a rumble, or rather literally with rumbling drums, slowly increasing in velocity, which then breaks into a signature Sandwich riff. 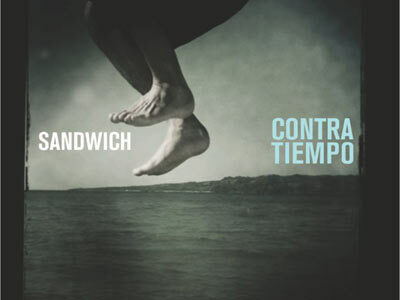 Welcome to Contra Tiempo we imagine Sandwich to be telling us in the first track, the aptly titled "Lapit, Lapit, Lapit," beckoning one and all to come. Once they've gotten your attention, now it's time to move, as their next songs, "Lakad" and "Takbo" encourage you to do. Should you be too lazy to do so, the songs at the very least will make you bob your head and your leg stomp on an imaginary drum pedal. Sandwich's taste for the eclectic, as their bright, happy, and frenetic guitars would suggest, shows itself early into the album. The band slows it down with "Dispalinghado," which is as downtrodden as you see these guys in this album, singing: "Nilasing ng antok, binulag ng gin pati pag ibig mo." One of the later songs, "Sugatan," does rival it with the opening line: "Sa aking balat nakasulat ang aking pag-ibig, tatak ng sugat." This one though definitely sounds less somber, less self-pitying and more accepting of the heartbreak, especially with the upbeat rhythm. The song which follows it, "Putik," speaks of loss as well, this time from the raging waters of the Ondoy disaster last year. Its most poignant line: "Sa ibabaw ng bubong, nakita kong nagunaw ang mundo." From that Ondoy tribute, Sandwich returns to what it does best with the next three tracks: "Sulputin," "Bisikleta," and "Downhill." Frenetic, energetic, filled with playful imagery, catchy wo-oh, wo-oh's and guitar riffs. Sandwich have always been undeniably fun, and they never lose that element in this album. With their songs, especially the more upbeat ones, they still elicit the feeling you had as a kid when it's time to play in the streets in the afternoons. Next comes "Stranded," highlighted by a spacey, nostalgic synth, juxtaposed with dirty guitars, and Raimund singing: "Stranded sa airport, stranded sa airport." These are the same distorted guitars in an earlier track "Pera Pera," although in its case, the star is Raimund's playful, hopeful lines: "Gusto kong yumaman tulad ni kuya, bibili ng maraming kotse para lumigaya, magtatayo ako ng magagarang bahay, sa Dasma, La Vista at Tagaytay. Pera, pera! Asa ka pa!" Album closer "Siesta" is perfect in the end, because after Sandwich takes you up and down in the album, you're going to need a little rest. Contra Tiempo is still indeed a fun listen, relying on the best elements of former Sandwich records, while rarely trying to experiment.